MEAT-LOVERS can often be satisfied by seafood that is the marine equivalent of steak -- rich, fatty, deep-ocean fish like tuna or swordfish, in a thick slab. But for true fish fanatics, nothing beats the whole animal -- head, tail, skin and bones -- as I was reminded on a recent trip to Japan. 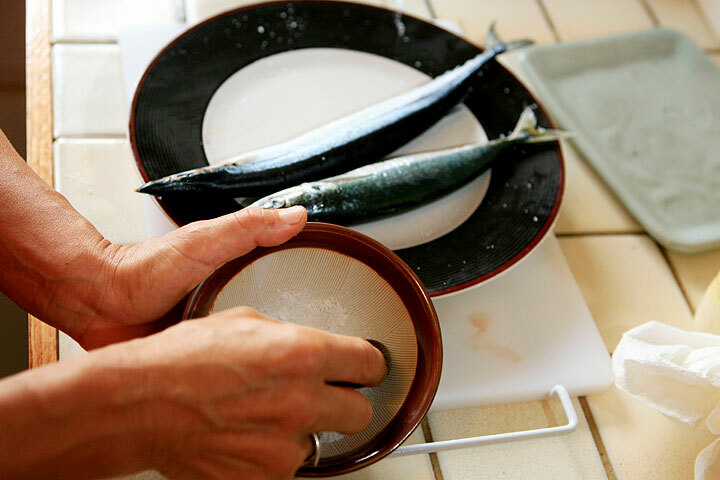 While Japanese certainly prize their fish raw, especially the freshest premium fish, it is just as typical to meet one's daily catch whole, on any occasion from breakfast to a formal dinner. 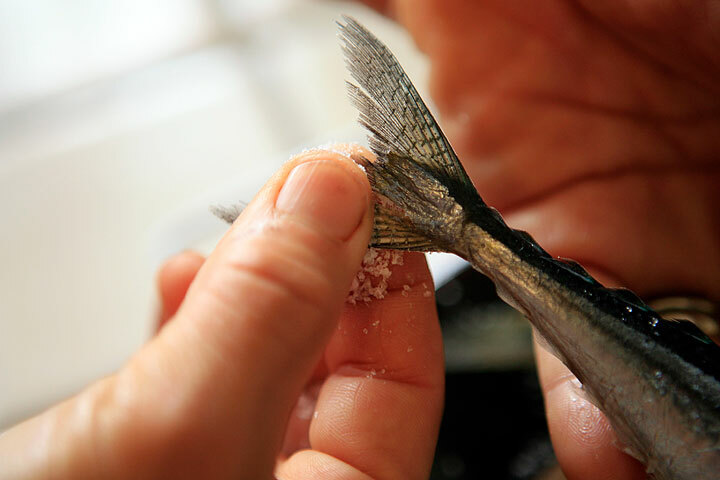 * Shishamo sold in Hawaii is usually capelin; true shishamo is found only in Japan. The fish consist almost entirely of roe. Choose larger fish (5 inches or longer), available at Marukai. 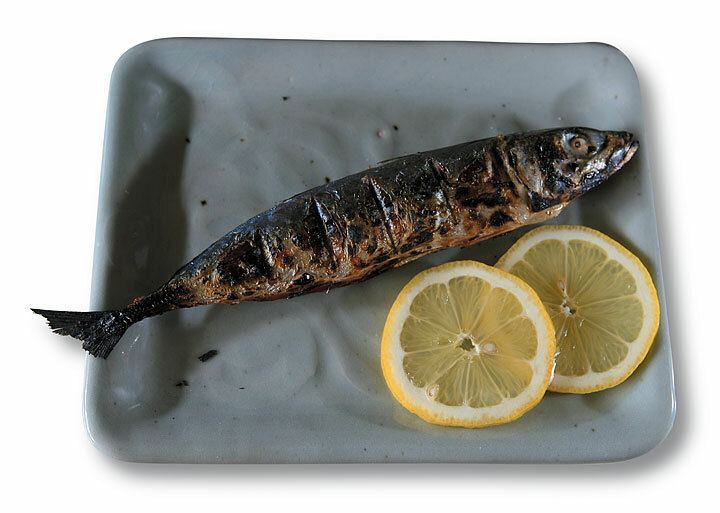 Sprinkled with salt and seared into a crunchy package containing soft, flavorful meat inside, shioyaki -- salt-grilled fish -- ranks among the food of gods for the felines among us who leave nothing on the plate but eyes and tail. So why is it that this Asian delicacy is never seen at island feasts otherwise rich with bounty from the sea? 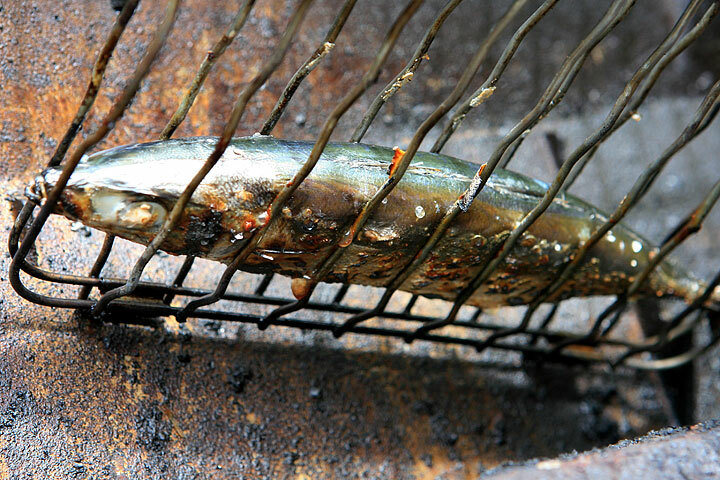 Aside from izakaya (Japanese pubs), grilled whole fish are rarely found on a menu, either. Skimming through Japanese cookbooks, I discovered that all the ingredients and tools needed are common to Hawaii, including sea salt (Japanese cooks having long shared the current rage for superior salts). 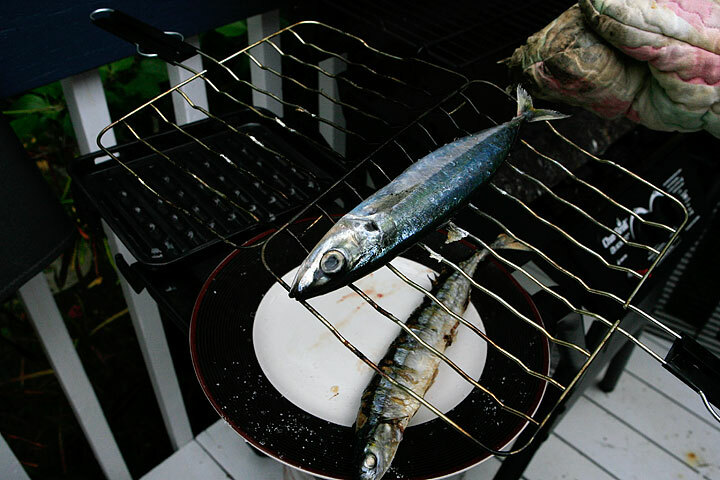 Thus armed with ignorance, I selected a few small fish at the market -- a fresh moi, some frozen sanma, a yellow corvina and tiny shishamo (river smelt) -- plus a metal fish-grilling cage. After scaling and gutting, I blithely doused the fish with salt, thinking that it serves to draw out the moisture and crisp the skin. After a seemingly interminable wait at the backyard grill with my barbecue-king husband peering under the tails every minute, we finally pulled the fish into the kitchen to find they had not turned at all crispy. They weren't overcooked -- amazingly -- but the skins were limp, salty and stuck to the cage; the fat moi steamed in its juices. Only the relatively flat corvina got a bit of that intense flavoring like jerky near the edges. After several more attempts using various types of fish, one thing became abundantly clear: I was going to have to grill an expert. 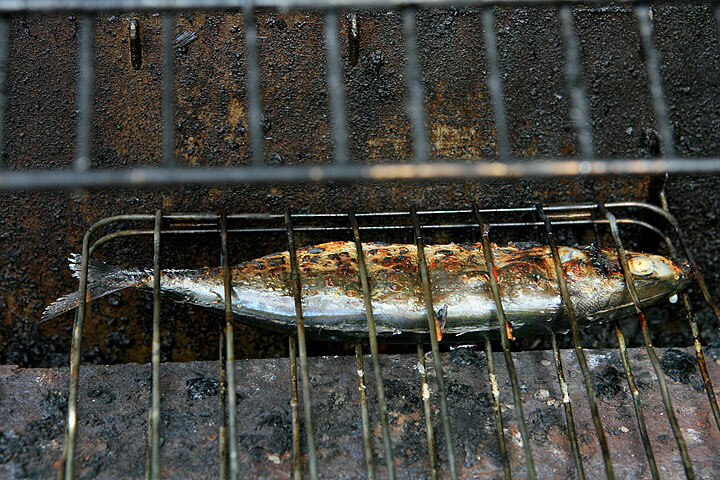 Salt-grilling fish Japanese-style is an exercise in extremes that rubs up against cookbook axioms about overcooking, toughness, timing and heat. Just as important as the fish or salt is the fire -- it has to be really hot, so hot that you can't hold your hand over it. Yukio Furukawa, head chef and partner of the soon-to-open Tsukiji Fish Market and Restaurant at Ala Moana Center, shared his tips for successful shioyaki, a standard skill for any Japanese cook worth his salt. Furukawa favors a charcoal fire, and in Japan a superhard charcoal that burns extra hot is available. With American supermarket charcoal, however, a lot is needed to get a consistent flame. A campfire would work, as Japanese inns often use the hearth. In any case, it's best to take the top grill off so you can get close to the flame. LIKEWISE, Furukawa prefers the traditional method of threading the fish on skewers, so the end result turns out wavy, as if still swimming on the plate -- with the side free of skewer marks presented to the diner. 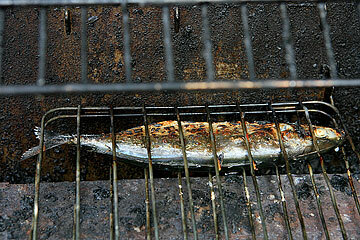 This takes a bit of skill, however, to keep the fish from falling apart while grilling. If you aren't fussy about presentation, it's far easier initially to use a grilling cage -- though a Japanese chef will blanch at the run-over-by-a truck results. Furukawa advises heating the cage over the fire until it's quite hot before inserting the fish, so the skin doesn't stick. The salt makes a big difference, and here the chef insists that you not cut corners and stick to rock salt or Hawaiian sea salt rather than table salt, which contains impurities and additives to make it flow. Also, don't oversalt -- the salt serves to enhance, rather than overpower, the flesh. Grind it fine in a suribachi or mortar and sprinkle about a half-teaspoon over each side of the washed, scaled and gutted fish. (Or leave it whole, as they often do in Japan, and nibble at the bitter intestines.) Rub more salt into the tail and fins to help prevent burning. Let the fish rest up to 30 minutes, especially if it is a fatty fish. THIS BRINGS US to the matter of the victim itself. Fatty fish are clearly preferred for shioyaki, as the oil content helps them turn crispy while remaining moist inside (as well as being rich in nutritious omega-3 fatty acids). For this reason, a Hawaiian reef fish is probably less desirable than cold-water or open-ocean (pelagic) fish. Traditional choices are sanma (Pacific saury), saba (mackerel) and iwashi (sardine), all available frozen. The Hawaiian pelagic fish opelu and akule, available fresh, are also excellent. Grill five to eight minutes on the first side, getting close enough to the fire to hear it crackle and sputter after a minute -- the flames could even lick the sides, Furukawa says. I always peek to gauge the look of the skin, which develops white blobs of fat, salt and moisture that drip into the fire. When these grow less conspicuous, turn the fish and grill for a minute or two less on the second side. Japanese like their fish hot or warm, with just a squeeze of lemon, daikon grated into a little bowl of soy sauce, or dipped into ponzu (citrus sauce). Defrost fish, if frozen, by soaking in water 20 minutes. Scale and gut (if desired) and pat dry. Sprinkle about 1/2 teaspoon salt over each side of the slightly damp fish. Rub more salt into tail and top fin to prevent burning. Let fish rest up to 30 minutes. Heat a grilling cage or metal net over a hot fire. Add fish and grill 6 to 8 minutes, close enough so that the flame licks the skin. You should hear crackling and sputtering after a minute. When skin is crisp all over, turn and grill a minute or two less on the second side. Serve hot or warm, drizzled with lemon or dipped in ponzu sauce or a small dish of soy sauce with a teaspoon of grated daikon mixed in. Serves 2. Approximate nutritional analysis, per serving, without ponzu sauce (assumes half salt is burned off in grilling): 700 calories, 36 g total fat, 10 g saturated fat, 200 mg cholesterol, greater than 3000 mg sodium, 2 g carbohydrate, 0 g fiber, 1 g sugar, 90 g protein. PONZU is a citrus sauce served with grilled meats and fish. The first variation here is slightly sweeter, with daikon to cut any "fishy" taste. The second sauce is more traditionally tart. Both recipes are from "The Legacy of the Japanese in Hawaii: Cuisine," The Japanese Cultural Center of Hawaii, 1989. Heat soy sauce and sugar until sugar dissolves. Add mirin, lime juice and sesame seeds; mix well. Serve in dipping bowls with grated daikon mixed in to taste. Yields about 1 cup. Leftover sauce may be frozen. Mix ingredients and serve in individual dipping bowls. Yields about 3/4 cup.